Who doesn't love Christmas, well except for the Christmas Grinch of course! The festive season always gets me very excited! There is a flurry of activity in our home from putting up the tree, hanging up a new wreath on the front door, decorating the house, wrapping gifts in pretty paper, making an advent calendar and paint dipping pinecones. This year, I'm especially excited as I'm partnering with Balsam Hill on their special 'Holiday Impressions with Balsam Hill' project! Christmas for us is smack bang in the middle of summer! Yes, that's right! While the rest of you in the northern hemisphere are snuggling up in the front of the fire, drinking hot cocoa with roasted smores and watching the soft snow fall, in Australia, we're having friends and family over for a seafood barbecue and jumping into the pool to cool off! Each year we put up our Christmas tree and decorations on the first weekend of December. Usually the entire house gets decorated for Christmas except for the bedrooms. 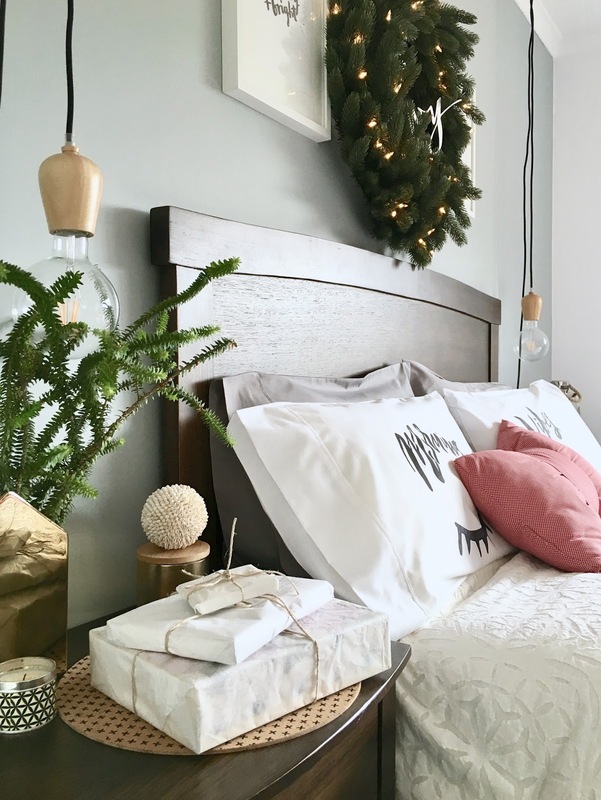 So this year, I decided to switch things around and decorate the master bedroom first and make it all festive and pretty so that we could enjoy it every day of this yuletide season! Since Melbourne is as hot as hot can be leading up to Christmas, I decided on a minimalist Scandinavian style to keep the décor fresh and bright in our bedroom and I couldn't be happier with the result. I decided to dress our home in traditional Christmas colours; a mix of whites, greens and pops of red and gold. The soothing grey feature wall turned out to be the perfect canvas for my Christmas colour palette. 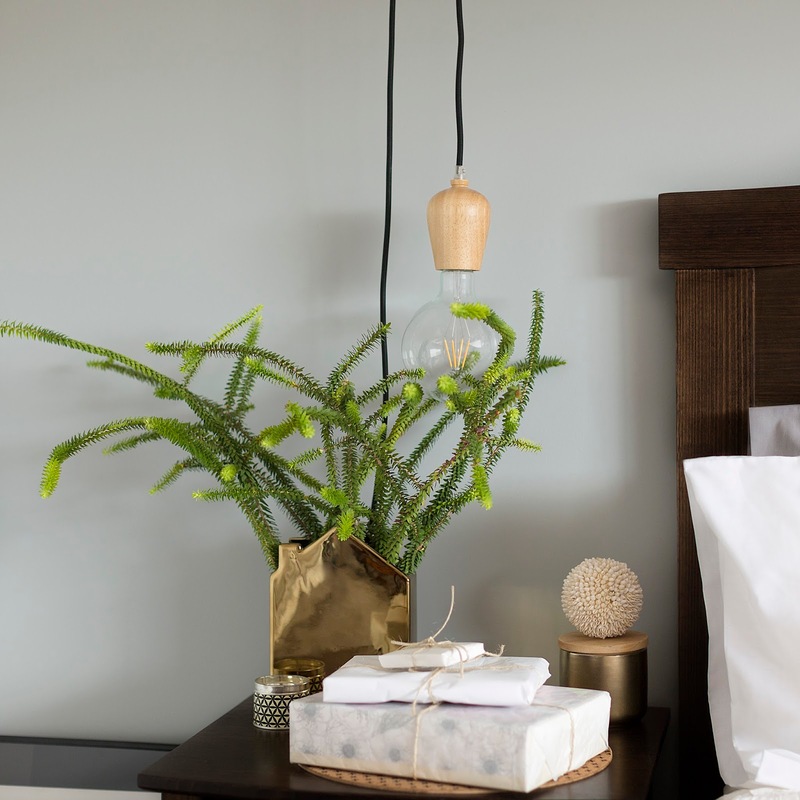 I dressed the room with fresh sprigs of greenery, crisp white linen on the bed, adding gold accents on the bedside tables and wrapped the gifts in white wax paper tied with natural twine to complete the fresh Scandinavian look. The muted red festive bow cushion adds a pop of colour and fun and the hand-knitted coral throw completes the overall look. However, the absolute cherry on the cake is the gorgeous yuletide Vermont White Spruce wreath! It feels like Christmas morning every single time I walk into the bedroom! 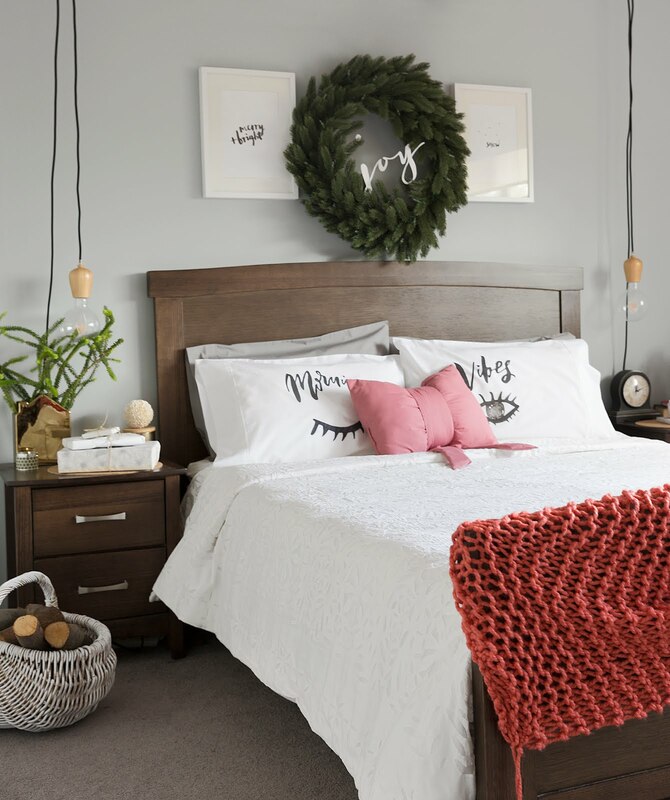 The festive 32 inch Vermont White Spruce wreath from Balsam Hill above our bed was the inspiration for this space. The size of the wreath is perfect for our bedroom as it stands out from the rest of the décor and at night the pre-lit foliage adds a warm, inviting yet glamorous touch to our room. 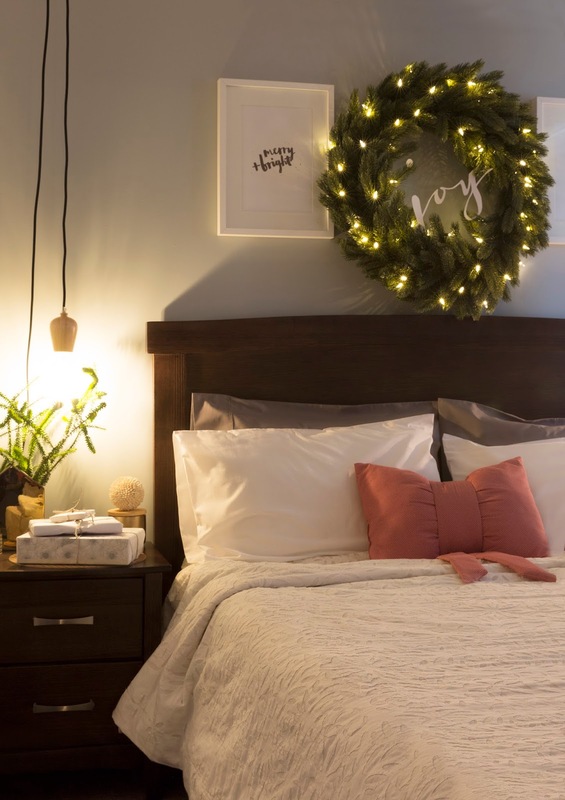 The Vermont White Spruce wreath has a strong wire frame to support the shape but also gives me the peace of mind that it will definitely not come apart and fall on top of our heads in the middle of the night. The thing that surprised me the most was how realistic the wreath looked! The dark green foliage is lush and full. The needles are long, thick and very authentic. The LED lights twinkle and sparkle at night and the battery pack comes with convinient timer options to choose how long you'd like the lights on for. The pretty cursive 'joy' was cut out from thick card paper and attached to one of the branches with a bit of double sided sticky tape. The white typography also complements and contrasts with the platinum grey wall and the dark green foliage. 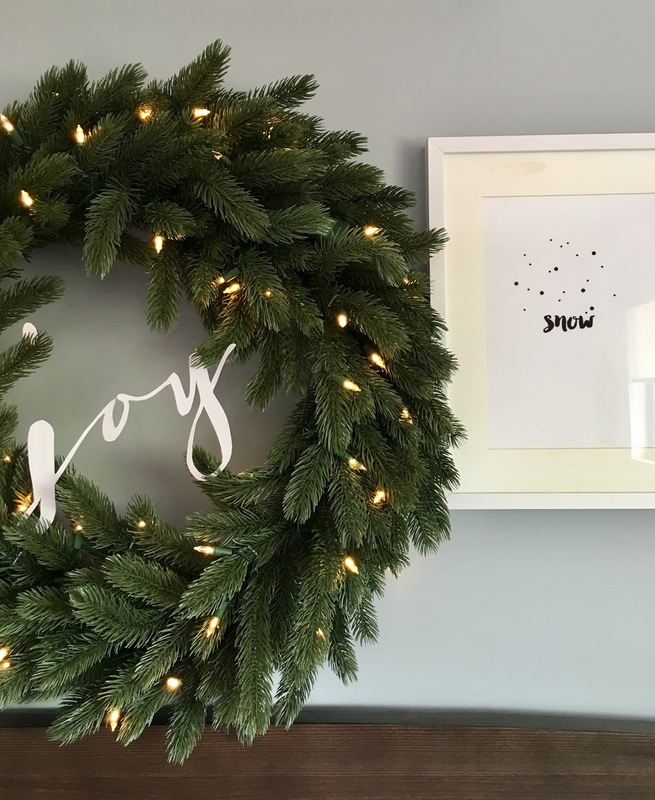 The bespoke prints - 'merry + bright' and 'snow' on either side of the wreath works well with the Christmas theme in the bedroom. I'm in love with my Morning Vibes pillow covers...an easy DIY project that I'll share later. The whimsical pillow covers add a bit of playfulness to the décor. They are also perfect as a Christmas gift since who doesn't love a bit of peppy typography? The soft cotton and organza quilt cover has a beautiful snowflake motif that is perfect for the occasion. I love scented candles and they are an essential in every room of my home. 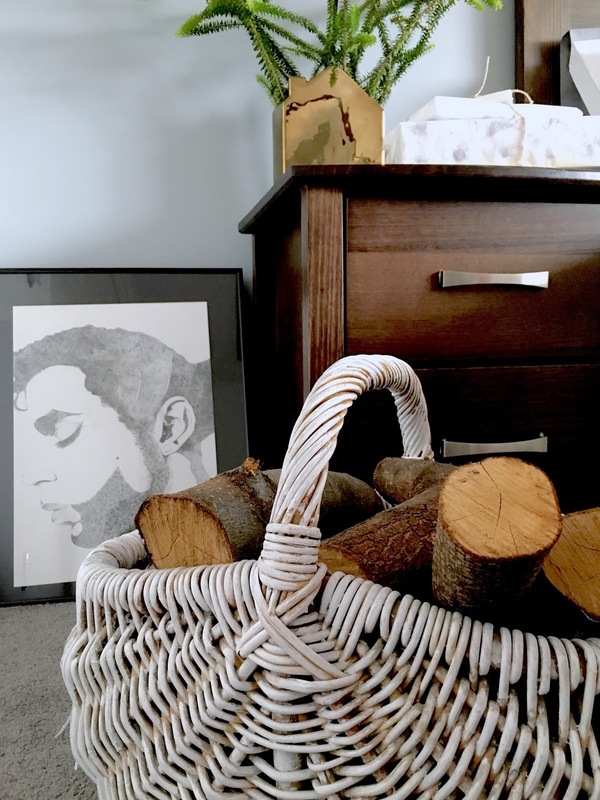 I added a basket of rustic logs to add to the organic and natural feel of bringing the outdoors in. Yes, that's a portrait of Prince that I drew ages ago. There is nothing more magical than the Christmas lights on at night. I'm so pleased with our beautiful wreath and the warm, cosy glow it casts in the room. Here's one more photo of our bedroom. I just love how pretty and festive it looks with the fresh colour palette and the beautiful light streaming in through the windows. My little one absolutely loves our bedroom. Her favourite part is to jump up and down on the bed, trying to touch the twinkling lights on the wreath! I could not be more happy with how our bedroom turned out. Minimalist yet festive, it was a lot of fun to decorate and the gorgeous wreath fits our room beautifully. If you'd like a similar wreath to mine, have a look here. Now that the bedroom is all done, I’m excited to start decorating the rest of our home! 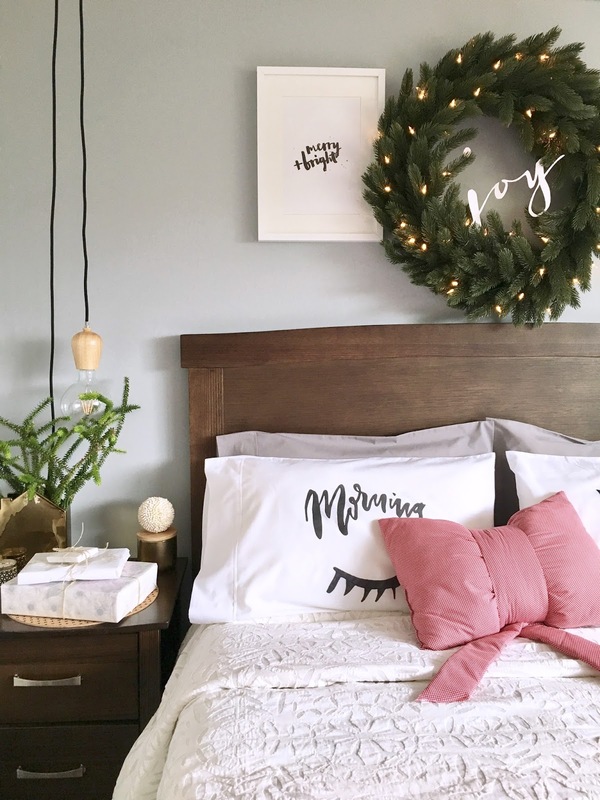 Do you decorate your bedroom for Christmas? Do share in the comments below. Till next time... from our family to yours, wish you all a happy and safe holiday season and Merry Christmas! This post was created in collaboration with Balsam Hill. Thanks again to Balsam Hill for providing me with the perfect festive wreath! As always, words, thoughts and opinions are all mine and genuine and I only ever work with brands that I love and I think you will too. How To Flip Properties for Profit! House Envy: Serious Scandi-Eye Candy! Are You Hygge-ing It Right? How To Style A Bedroom In A Small Apartment! Our Top Ten Hot Picks: Smokin' Hot Copper Chairs! Ding - The Smart Way To Answer The Door!